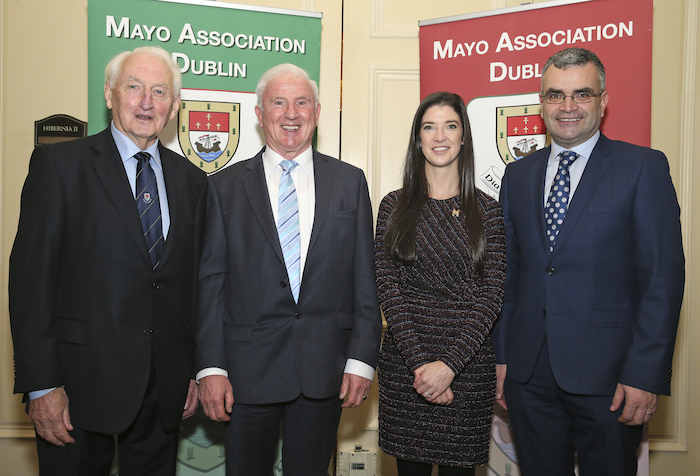 Almost 500 guests attended the annual Mayo Association Dublin Business lunch in the Intercontinental Hotel Ballsbridge on Friday last. Tickets for the event were in high demand and were sold out weeks in advance with a long waiting list registered to attend. The lunch is a key highlight in the social calendar of the Association which brings together Mayo business people from a diverse range of industries, professions and disciplines, affording an opportunity for the attendees to mingle and network in an atmospheric setting. Minister for Health, Simon Harris TD, addressed the lunch as this year’s guest speaker, remarking that Mayo had played a vital role in attracting foreign direct investment to Ireland and that the presence and commitment of these companies in the county was a testimony to the positive economically focused environment that has been fostered in Mayo - as well as the amount of successful indigenous industries in the county. He spoke about the impact that county Mayo and its people have had on all aspects of national and international affairs of politics, business and civic life, having provided the country with a Taoiseach, Michael Davitt, the first female president, the founder of the Argentine Navy and some of the earliest literature - and thanked Mayo for its contribution to the country and the world. A gin bar sponsored by Connaught whiskey greeted the guests on arrival before they were treated to a three-course meal. The event was presided over by PRO Derek Reilly, a Belmullet native, who updated guests on upcoming events, including the grand final of the Mayo Schools' Debating competition next weekend in Trinity College. He also formally announced the opening of nominations for the Mayo Person of the Year awards 2019. Chairperson Julie Doyle announced the launch of a new mentoring programme initiative for young Mayo people in Dublin, which was warmly received. She also announced plans to host the annual Michael Davitt lecture next year, to provide some much needed recognition to one of Mayo’s overlooked heroes and to highlight the work of the museum in Straide. For further information and updates on upcoming events please visit www.mayoassociationdublin.com or follow them on Facebook, Twitter, YouTube, LinkedIn and Instagram.